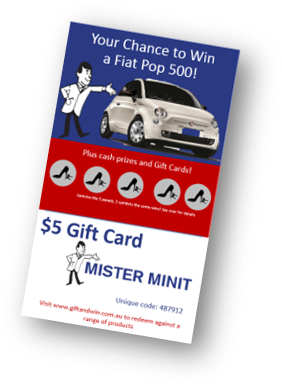 Gift and Win cards can be sold at your retail outlet as an impulse purchase, promoting your brand and increasing revenue. An instant win component which immediately engages customers, Gift and Win cards are a great way to drive your customers from retail to online. Select the card theme and winning prize for your promotion. Once a package has been selected, you can begin to promote it to customers. We offer prizes up to £1 million and if someone wins, WE pay out the prize money! The promotion offers a strong impulse buy opportunity. The application is very flexible, tailored to your own specific needs. 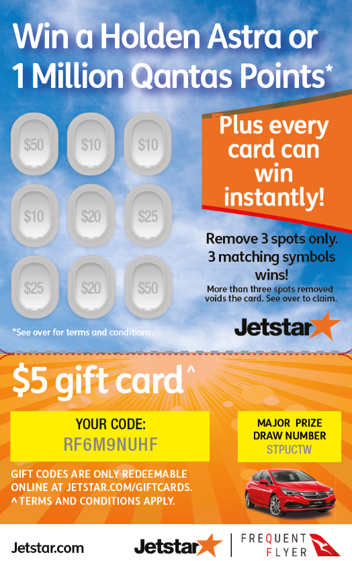 JetStar airlines have been successfully using Gift and Win onboard and in airports as a means to not only raise revenue but also to engage with customers and increase online sales.  The Gift and win cards have been very well received and our fantastic staff rewards program aids the sales process and rewards staff for making sales!